Railpictures.ca - Carl Noe (Collection of Jason Noe) Photo: CN GP9RM 4111 leads the 15:30 Kitchener local down the Huron Park Spur in Kitchener less than a month before the original of takeover of the Goderich-Exeter Railway in November 1998. In the last two decades this area has changed dramatically with the installation of the GO Transit layover facility and the CTC installation on the Guelph Subdivision. Thank you to Stephen Host for all the photo editing work on this one. | Railpictures.ca – Canadian Railway Photography – photographie ferroviaire Canadienne. Copyright Notice: This image ©Carl Noe (Collection of Jason Noe) all rights reserved. 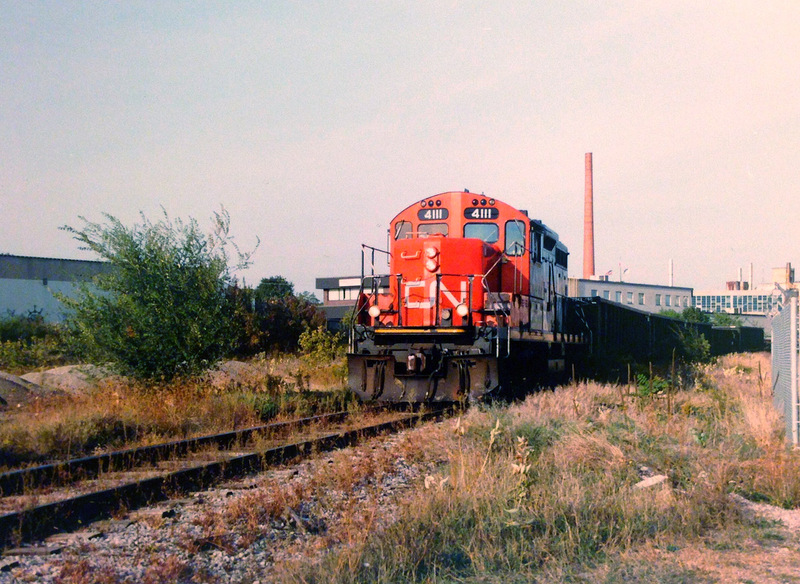 Caption: CN GP9RM 4111 leads the 15:30 Kitchener local down the Huron Park Spur in Kitchener less than a month before the original of takeover of the Goderich-Exeter Railway in November 1998. In the last two decades this area has changed dramatically with the installation of the GO Transit layover facility and the CTC installation on the Guelph Subdivision. Thank you to Stephen Host for all the photo editing work on this one. Yes!! I stand corrected of course, i forgot about those two trains. Thank you. I remember when 89 used to use the wye.. it was late at night and I saw it a few times across Wellington St. It was back when I worked in Waterloo and had many a late night. Wellington/shirley were good back roads to avoid Victoria in the commute home. On a similar note remember 688? The midnight train VIA tried to run – really should have been a deadhead but they attempted to take passengers.. after 1200.. wasn’t well patronised and culled. I believe it was actually 89/86 that used the eye and tied down the train in the Kitchener Yard for that brief period that VIA did the turn around at Kitchener. GEXR used the Kitchener Y frequently to turn the Kaolin hopper that Chemtura (now LanXess) receives about once every 3-4 weeks, that occurred until an observant GEXR crew member notified them it would be easier to spin the connection under the hopper then actually turning the entire car…..long story but anyway. GEXR often stored excess traffic for Air Boss on the west leg of the Y, this happened on and off thru out the year. All of the Bridgeport Spur has been removed except for the east Y switch which is infront of the new CN yard. office. The Bridgeport spur (wye) was used daily until VIA 84/7 was terminated at London instead of Kitchener. 87 would wye there every night otherwise and needed enough headroom for their 6 or so car train. There was a stop block a few car lengths north of the bridge at wellington, but the tracks continue to just shy of Guelph St but are buried in the weeds. There’s even a switch at Guelph St, unless it was all removed, I haven’t been there in a few years. The pavement in the road is still as it was when rails were removed (patched). I’ve been intrigued at what went on back there in the 90′s as I would imagine the spur had a few customers back then..
Graydon find old maps of Waterloo that show the CNR spur (and the Interurban/Streetcar line) that both went to Bridgeport. Fascinating history. Thanks for the comments Graydon and RLK2211. I only have photos of one GEXR movement on the wye back in 2000 when the units actually crossed over the Wellington Street bridge. Sadly, the spur was mostly abandoned by the time I picked-up my first camera. At that time it just ended about a mile or so from the bridge if I remember correctly. @Railfan99 – that’s the old Bridgeport Spur, at one time long ago it did actually go to the Bridgeport area if Kitchener. Great shot Jay and great timing!! I still got yet to catch some CN action in Kitchener but it’s getting warmer so I’ll be out there soon! Also just curious, i forget the exact name of this spur or subdivisions but it ran north from Lancaster Yard over Wellington st where the abandoned rail bridge actually still stands and also had a Y like turnaround/runaround track. Do you happen to know much about that particular line or have and photos of trains up there before the line’s demise? Just a curious though I had. Thx for posting these CN shots! I love em!